Whoa, it looks like you have a peeping tom on your hands. He's pressed tightly to your window, trying his darnedest to get a peek at whoever is roaming inside your house. Oh never mind, that's no peeping tom! It's just Ogler the Clown! No need to worry, he's harmless. He just likes to pop his head in the window every now and then to say hello. Ogler makes his rounds through the neighborhood cause he wants to make sure that he gets a chance to see everyone. Aw, what a thoughtful, yet creepy little guy! Whether you think this clown is friendly or downright spooky, this Halloween decoration is bound to get a lot of attention. The clown window decoration attaches to glass or house siding, so it appears as if you have a red-haired spy peering into your home. 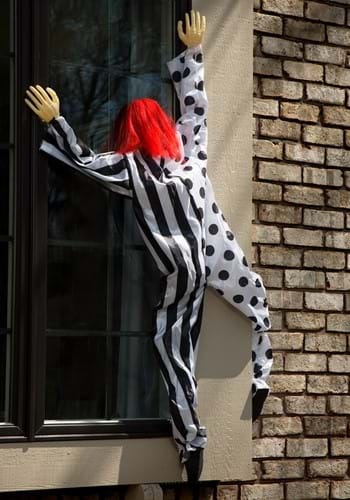 The hanging clown will illicit chills from passerby who suffer from coulrophobia and anyone who has an intense fear of peeping toms!